After being criticised by sections of Sierra Leone’s media for what they see as the president’s harsh lambasting of chiefs and village heads in the north of the country, he was in Kenema – south of the country yesterday, Saturday. President Koroma met with stakeholders – including paramount chiefs and religious leaders to discuss progress in managing the Ebola crisis. He praised the people and community leaders of Kenema, for the efforts they have made, including health workers in containing the spread of the virus in the district. Kenema, once renowned as one of the two epicentres of the Ebola outbreak in Sierra Leone, has seen a rapid and impressive turnaround in stemming the wave of new infections and transmissions. But the district is far from being out of the woods. With several conspiracy theorists now saying that a catastrophic incident, caused by rogue scientists working at a covert Ebola research centre in Kenema, was responsible for what has now become a major humanitarian disaster, the people of Kenema are working hard to be seen as a fine example of how Ebola can be contained. President Koroma visited the Ebola Treatment Centre in the district, which is being managed by the International Federation of Red Cross. 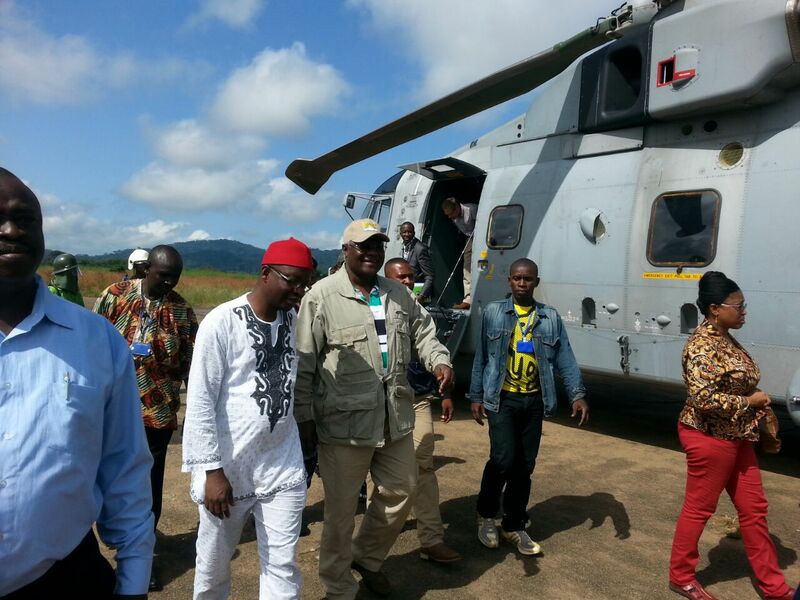 Accompanying president Koroma was the chief executive of the National Ebola Response Centre – Major (Rtd) Palo Conteh. Speaking with a cross section of the Kenema community and stakeholders, he praised the people of Kenema for their resilience, and urged them to continue to maintain the discipline that has enabled them to respond positively to the crisis. The District Medical Officer – Dr. Vandi presented a report to the president, demonstrating efforts undertaken by the district in halting the rapid rate of infection and transmission. Although there has been relatively fewer new cases of Ebola found in Kenema in the last month, according to the latest ministry of health and sanitation ‘Situation Report on Ebola’ for 23rd may to 31st October, 2014, Kenema still has the highest cumulative number of confirmed deaths at 255. This represents an increase of 6 deaths in Kenema since the 25th October, after a rise of just three in the previous seven days. But Kenema is not unique, as the total cumulative number of deaths continues to grow across most districts in the country. The total cumulative number of people that died of the Ebola virus in Sierra Leone, between 23 May and 31st October 2014 was 1070, an increase of 33 since the 25th October. With the exception of Bonthe, Kono, Moyamba, Bo and Koinadugu districts, every other district has recorded an increase in the number of deaths since the 25th of October, once again posing a threat to the efforts of health agencies in containing the virus. In Kailahun the number of deaths continues to rise slowly from 223 to 226 in the last six days; Kono 18 – no increase in three weeks; Kambia 11 from nine – six days ago, after recording zero increase in the previous two weeks. After what was first thought to be a sudden Ebola attack in Koinadugu last week, with all seven confirmed cases having died of the infection, the government says that there have been no further confirmed Ebola deaths in the district. The cumulative number of confirmed deaths in Bombali continues to rise, and now stands at 142 from 137 in the last six days, with the largest cumulative increase of ten recorded in the previous two weeks. Tonkolili 49 – up four, but a drop of 50% on the rate of increase in the cumulative number of deaths recorded six days ago. Port Loko 77 deaths – an increase of three deaths, compared to the increase of eight recorded last week. Pujehun is seeing a slow rise in the number of deaths, as the cumulative total on 31st October stood at 16 – up two in six days, after recording no increase almost three weeks ago. A week gone by, and the cumulative number of deaths in Bo on the 31st October, remain at 59, after an increase of four about three weeks ago. Both Moyamba and Bonthe are weathering the Ebola storm quite well, with cumulative total numbers of deaths standing at 33 and 1 respectively. Freetown – the new capital of Ebola, once again is continuing to experience huge rises in the number of cumulative deaths, with local media reports speaking of hundreds of deaths a week. But according to the ministry of health and sanitation figures, on the 31st October, there were 176 cumulative confirmed deaths, an increase of 8 in six days, with the total cumulative number of suspected and probable deaths standing at 365. Speaking to the media on his maiden press conference since his appointment as chief executive of the National Ebola Response Centre, retired major Palo Conteh expressed disappointment at the continuing under-reporting of Ebola statistics and promised to sort out this mess. What cannot be disputed however is that the total cumulative number of confirmed cases recorded in Sierra Leone on the 31st October, 2014, shows a rising trend. There are now 3,938 cases – an increase of 376 in six days. The total cumulative number of probable and suspected cases now stands at 675 – a rapid rise of 105 in six days. With the Kerry town Treatment Centre almost completed, and the Hastings Treatment Centre continuing to make good progress in the testing of new cases and releasing of patients they believe have fully recovered from Ebola, there is hope the virus could soon be kept under some control in Freetown. But the pace of testing and treatment across the country cannot be accelerated, until the number of doctors and nurses can be significantly increased, as well as the quality of their training improved. With the arrival of hundreds of British military medics last week – in addition to the 160 Cubans and about 50 Chinese already working in the country, there is every hope of Ebola being defeated, as the total number of cumulative confirmed Ebola cases in Freetown on the 31st October reached 1,158. Freetown – the capital of Sierra Leone, has now recorded more Ebola cases than Kailahun and Kenema (both original Ebola epicentres), Pujehun, Kambia and Kono – all put together. And this is posing a massive threat now to national security. According to the ministry of health’s figures for the 31st October, the total cumulative number of cases in Freetown has reached 1,158 – an increase of 157 in the last six days, compared to the increase of 246 recorded in the previous six days. Port Loko – home of the country’s information minister Alpha Kanu, whose denials and gaffs about Ebola contributed immensely to the government’s slow and poor response to the outbreak, is now sadly recording one of the highest numbers of Ebola cases in the country. On the 31st October, the total number of cumulative cases stood at 557 – an increase of 66 in six days, compared to the increase of 19 recorded in the previous six days. Sixteen days ago, Kailahun once again became a centre of concern for health agencies, following the recording of a cumulative increase of nine new cases. But as the Sierra Leone Telegraph reported last week, it seems that increase was just a bleep, with a slightly smaller increase of three recorded in the last six days in Kailahun. This brings the total number of cumulative confirmed Ebola cases in Kailahun to 554. 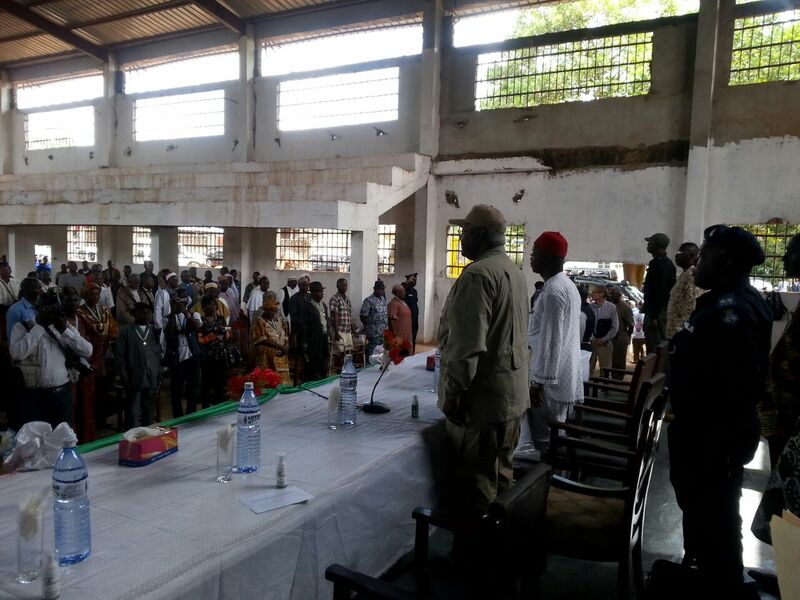 President Koroma’s whistle stop in Kenema on Saturday, 1st November was an appropriate and very well timed decision, given the steep rise in new cases witnessed in the district about three weeks ago, which now appears to have slowed down. This was recognised by the president when he told doctors, health workers and community leaders in Kenema: “Today, I want to encourage the people of Kenema to continue doing the good things that they have been doing up to this time,” and added that the initial fear, ignorance and lack of knowledge even among health workers served as a serious challenge to the fight against Ebola. “But with time we have tried to address these issues as you have seen from the presentation. The people have become more knowledgeable. The fear has gone. The health workers have equipped themselves better. The communities were not having enough information on the virus, lots of sensitization has taken place, paramount chiefs, political parties, civil societies, parliamentarians have all been involved and if we arrived at a situation where everybody has been involved and where Kenema is telling a good story, I think we need to take a new approach,” he explained. The total cumulative confirmed number of cases in Kenema is now 490 – a much smaller increase of two in six days, compared to the cumulative increase of 22 seen over the previous six days. Last week we asked, whether Kono is managing to keep Ebola under control, after a good spell without any new cases in almost two weeks. According to the ministry of health figures for the 31st October, it would seem as though Kono is taking all the necessary measures to contain the virus. The total cumulative confirmed number of cases in Kono stands at 39 – an increase of just one in the last six days, compared to the increase of three recorded about sixteen days ago. Is Bombali coming out of the woods, after those shocking number of new cases recorded six days ago? Official figures released on the 31st October, confirmed our worst fears. The rate of infection and transmission in Bombali is showing no let up, and remains second to that of Freetown. Kambia continues to raise the red flag, as the rate of infection and transmission continue to rise slowly. The total number of confirmed cumulative cases now at 39 – an increase of 4, compared to the increase of one, recorded during the previous ten days. As we reported last week, the people of Koinadugu are trying to come to terms with the nationwide shock of discovering their first ever officially confirmed cases of Ebola. And there is little doubt Ebola had been present in the district for a while, but due to poor monitoring in the district, several deaths caused by the virus had previously gone unreported. According to figures released for the 31st October, the total number of cumulative confirmed cases in Koinadugu district has gone up to 15 in the last six days – up six, compared to the two reported over ten days ago. WHO and the government have quarantined some villages, but the true extent of Ebola in Koinadugu is yet to be made public. Tonkolili has witnessed a rapid rise in the number of new cases in the last six days, and it is not clear as to why the rate of infection and transmission in the district appears to be uncontrollable. The total number of cumulative confirmed cases now stands at 210 – yet another increase of 30 in six days, compared to the similar increase of 30 seen in the previous six days. After much hope of a lull in the significant increase in the cumulative rate of infection and transmission seen in Bo about three weeks ago, there are concerns now of the district sleep walking into a major disaster. The cumulative total number of confirmed cases in Bo stands at 180 – an increase of 13, compared to the increase of 14 seen about six days ago. Bonthe continues to show resilience, with the total cumulative confirmed number of cases still at just two. The total number of cumulative cases in Moyamba has gone up by six in the last six days; while Pujehun seems unable to stop the trickle, with an increase of two in the last six days. Once again, as in our previous reports of the last two months at least, Freetown the capital city and Bombali in the north, are the Ebola epicentres of Sierra Leone. Of the 95 confirmed new cases recorded across the country on the 31st October – compared to 70 recorded on the 26th October, over 50% of those new cases were found in Freetown. 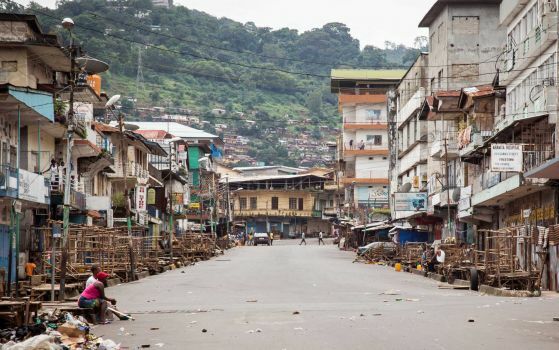 There is widespread call now for another lockdown in Sierra Leone, especially with the massive medical, military and logistical resources now available to the government, from the British government. This critical mass is vital. But any such lockdown must have clear clinical goals and a well thought out implementation strategy, rather than simply embarking on another awareness raising and soap handing down campaign. The latest news received from Freetown this morning after going to press, says that another Sierra Leonean doctor Godfrey George has been infected with the virus. He contracted the virus at the Kambia hospital where he worked. The total number of medical doctors that have died of Ebola is four. 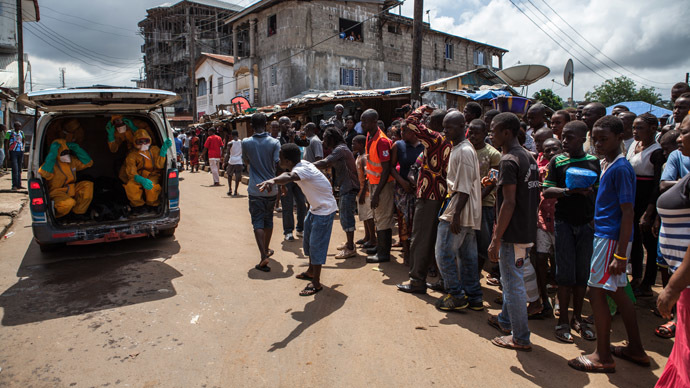 Over two hundred other health workers have so far died of the disease in Sierra Leone. Thank you very much for your good work and continue to be objective, however high the temptation is to see things on party lines. Will it be possible to make a simple Ebola statistics? May God and our friends help us to overcome this terrible disease.